It had been 10 days already into our grand adventure into the untouched mountains of Nepal. We had climbed up from the lush lowlands of Nepal through the restricted Tsum Valley to the border of Tibet, high in the Himalayas. This area had a pervasive Tibetan Buddhist culture, clad with monasteries tucked into the mountain landscape and perfect untouched nature along the way. To see more about the first part of our story, check out Nepal Undiscovered, Part 1: Tsum Valley Trek. The adventure continued onto the Manaslu Circuit, and took us up to 5,100 meters (17,000 feet) around the eighth highest mountain in the world. The story continues below. Crossing the Buddhi Gandaki River leading into a narrow gorge on the trail up to Mt. Manaslu. Heading downhill out of Chumling and out of Tsum Valley, I was restored with energy as the altitude decreased and excitement to begin the route towards Mt. Manaslu mounted. We ran into trouble in the afternoon when Ally took a wrong trail up to Nyak instead of continuing on the river route and we all worried for her safety. Our guide Ram headed uphill to chase her down and we were overjoyed once they rejoined the crew in the late afternoon. She told us how the people in the village above were shocked to see her as it had been weeks since a trekker had made their way up there. I was happy to have her back! We enjoyed a pot of lemon ginger honey tea in a wooden teahouse along the icy blue river running through the narrow gorge on either side of us. It was nice to feel warm(er) temperatures again at this low altitude in Pewa. Last night I had enjoyed a pizza to celebrate Ally's return and paid the price! Woke up with food poisoning and learned the hard way that dal baht is the only safe thing to eat on the trails. Really, do resist the urge to eat that pizza or burger or anything else that tickles your fancy. I was well behind the group for the first half of the day. Walk, puke, and repeat... Once we all met back up in Bihi Phedi for lunch, I took a nap and felt a bit better. We all ascended the trail up to Prok together in the middle of a lush forest and explored some ice-cold waterfalls on the side of the trail. We celebrated Rajat's birthday and he seemed happy as a clam to be spending it in the place that he loves most: the mountains of the Himalayas! The birthday boy happy to explore the trailside waterfalls. Met with the decision to climb over 1,200m up to Kal Tal (Death Lake) in a loop from the village of Prok, Ally and I decided to take the day off and relax. This was definitely the right decision for me after feeling so ill from the food poisoning the previous day. We ate plates of momos, did some laundry by hand, chatted, and enjoyed the best dal baht of our entire trip. We were happy to hear that the boys had a fun trip up to Kal Tal and finally felt re-energized to begin the climb up back up towards high altitude and illustrious Larky-La Pass. Star trails above a Buddhist stupa on a chilly night in Prok. Lord Shiva, destroyer of evil, etched into stone on a brilliant mani wall coming out of Prok. We climbed down from Prok for three hours to the riverside village of Namrung, where we ran into the first source of Wi-Fi in the two weeks we had been trekking. To be quite honest, it was great to be able to check in with loved ones, but it didn't feel natural to be able to contact the outside world on an adventure such as this. After this distracted lunch hour, we continued again along the Buddhi Gandaki River through lush foliage and massive Indiana Jones-esque boulders and again climbed upwards. The ensuing five hours took us up through mountain villages with stupas painted with the eyes of Buddha that followed us as we trekked on through. Continuing through dense and lush forest towards Namrung. The ever-present eyes of Buddha on stupas overhead. As the daylight began to recede, I crossed through a forest of orange and green pines and Mt. Manaslu came into view right in front of our eyes. The village of Lho appeared like a fairy tale with the massive mountain smoking in the background. Clouds whipped around the peak and turned shades of pink and purple as the sun set and again I was humbled that such beauty can exist in this world. One of the most incredible sights I've ever seen in my life. We even had perfect clarity that evening, so Jimee, Shalom, and I watched the Milky Way fly around the sky around Manaslu. The fairytale that is the village of Lho in the shadow of the glaciers. Changing colors of the foliage as we headed to the limits of the tree line. Passing through the forest around Shayla. We had a nice meandering walk along an icy river to the village of Shayla with glacial mountains surrounding us. Just breathtaking. We arrived to Samagaun within a few hours and had the afternoon to relax and explore the gompa situated just above the town. It was wild to have Mt. Manaslu just above us and we dreamed of reaching the base camp and climbing ever higher to its peak. There were even people flown up in a helicopter to skydive down from its heights back down to Samagaun. Wild. The glacial landscape across a long rope bridge. Buddhist prayer wheels coming into the village of Samagaun. Seated just below Mt. Manaslu. Ally and I taking in the insane landscape at Birendra Tal. In the morning, we ventured to Birendra Tal just besides Samagaun with an insane view of Mt. Manaslu above. This lake was beyond any I've ever witnessed and you could hear the cracking of avalanches on the far side of the lake up the glacier. We stacked rocks and skipped rocks across the icy blue water. Rock piles at Birendra Tal. We walked for three hours on to Samdo and watched the trees change colors as we went along. We passed above the tree line and were greeted with light snowfall once we reached. Samdo was at higher elevation than anywhere we went inside Tsum Valley and we were greeted with true bone-chilling cold. We stayed by the fire as snow fell outside our lodge outside and discussed the semantics of climbing to the tent camp of Dharamsala and on to Larky-La Pass and back down. We had 1,300m to climb up within the next 36 hours alone! The entry to Samdo just before the snow began to fall. A map for the way from Samdo to Larky-La pass. The snowfall from last night washed the landscape with white. We climbed to Dharamsala, a tent camp at 4,400m in the midst of snowy mountains and glaciers. The air was noticeably thin, the path snowy and slippery, and this made the walk rather challenging. The views around were insane and I loved to see the happy yaks in the snow. Upon reaching high camp, I felt the altitude quite a bit, so I hung out around the camp for the day watching the blue sheep eat trash, then sat quietly by the river watching the snow fall. Saw three massive birds above too. We tried to stay warm in our small tents and prepared for a 2:30AM wake up call the next morning. A happy yak enjoying the fresh powder snowfall. Birds silhouetted against the glaciers in Dharamsala. The coldest and most anticipatory night sleep of my life was welcomed by the interruption of our 2:30AM alarms ringing in the night. Ally and I exited our tent to pear at one of the brightest skies of stars I've ever seen. We ate our chapatti omelets rather quickly this morning in anticipation of beginning our long and arduous journey up to Larky-La Pass at 5,100m, about a 700m incline from where we currently were at Dharamsala (4,400m). We left at 4:00AM under the blanket and guidance of the stars above. The weather was perfect and all wind has subsided the night before giving us clear skies and the sun to warm our frozen bones. The air thinned as we ascended, so much I could only move at snail speed along the rocky pass. Upon reaching a teashop about two hours into the walk, we enjoyed a warm cup of tea and continued yet even higher. Our group at the teashop before heading to Larky-La Pass. The glaciers flanking our left side cracked with massive avalanches falling from height. The rocky pathway and frozen lakes on our right were difficult to traverse and slippery under our feet. Around 8:00AM, we ascended a rocky hill that was illuminated with mazes of colorful prayer flags and I screamed aloud in excitement that we had finally made it! 5,106 meters tall into the sky; around 17,000 feet! I couldn't believe that 18 days after our journey had begun, we had finally made it. We stopped to take photos and lay a few more flags amongst the rest. The feeling of gratitude and sheer joy filled the joy as more trekkers ascended to join us. The treacherous frozen lakes to navigate through. Rajat and I ecstatic to have reached Larky-La Pass! Our guide, Ram, stoked as well to have reached the pass. After some time, Ally began to feel the effects of the altitude, so we began the long walk down to Bimthang through a massive, slippery rock fall area. The descent itself was very difficult and everyone in our group fell at least once or twice. Once we got past the rock fall area, we all collapsed at a tea stand and took a well-deserved tea and cookie break. I felt so grateful to be back at low altitude and breathing well again. It had been one of the most physically challenging mornings of my life! In the late afternoon, we finished our long, long day in the town of Bimthang with a few beers. The mood was light as we reminisced on the past three weeks of adventures and felt a bit sad that our adventure was soon coming to a close. The crew set out of Bimthang slowly as if to treasure our last morning of this grand adventure. 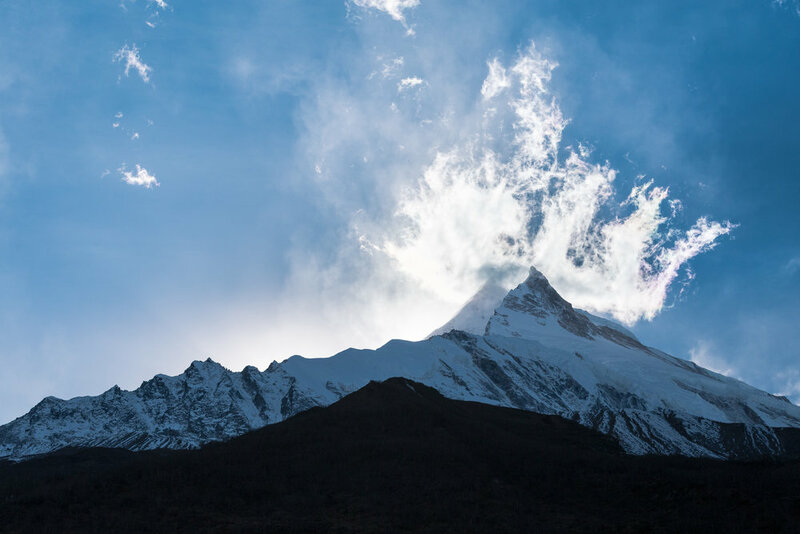 We watched the sun rise from behind the snow-capped mountains and we reached the intersection of the Annapurna mountain range. As we descended further and further, color came back into the trees in bright orange and reds as the last colors of fall fell from the trees. We walked all day and watched the landscape change and made it to Dharapani late in the afternoon. We settled in to this major town at the end of our trekking journey that served as a major hub for those about to begin the Annapurna Circuit. We felt relieved and exhausted and enjoyed a cold beer before finally drifting off to sleep. Looking upon Annapurna II and IV as we exit the Manaslu Circuit towards Dharapani. A sad day for our group, because climbing into the jeep to start our drive out meant that our days filled with trekking through the mountains were over. The road from Dharapani to Besisahar was treacherous and bumpy as hell, but there were many waterfalls to look out the window over. We chuckled at the fresh trekkers heading up to begin the Annapurna Circuit out of Dharapani with huge backpacks, looking rather winded and we reminisced on our first days on the trail. After we passed the final checkpoint into Besisahar, we settled into our hotel for the evening and celebrated with our first warm showers in three weeks. Just glorious. Had some celebratory whiskey and laughs with the crew and started to mentally prepare for our return to chaotic Kathmandu the following morning. The next day we assembled in a large van with all of our gear and drove the 8 hours back to Kathmandu feeling so so sad to leave the Himalayas. We all spoke about potentially hopping out and starting up on the Annapurna Circuit to prolong our return to the real world. As the dust and the busy streets of Kathmandu came into sight, we were excited to eat something other than dal baht and have contact with the outside world again, but a feeling of unease settled like a weight upon my chest. The wind in my hair and the crunch of the trail beneath my feet and the crisp morning air against my skin had become the norm. My heart fluttered as I longed to return to the elements and be under the sky once again. I thought that no matter where I go, no matter what I do, the mountains would forever feel like home. And the mountains have called ever since. Taking in the beauty of the sunrise over the mountains above. Image by Aleisha Moore. Post featured on Outdoor Project.